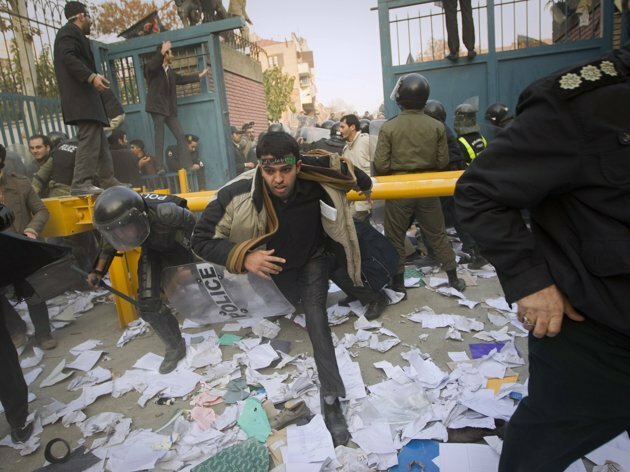 TEHRAN, Iran (AP) -- Hard-line Iranian students stormed British diplomatic sites in Tehran on Tuesday, bringing down the Union Jack flag, burning an embassy vehicle and throwing documents from windows in scenes reminiscent of the seizing of the U.S. Embassy compound in 1979. The mob surged past riot police into the British Embassy complex - which they pelted with petrol bombs and stones - two days after Iran's parliament approved a bill that reduces diplomatic relations with Britain following London's support of recently upgraded Western sanctions on Tehran over its disputed nuclear program. Flames shot out of a sport utility vehicle parked outside the brick building. Demonstrators outside the embassy also burned British flags and clashed with police as the rally, which had been organized by student groups at universities and seminaries. Less than two hours later, police appeared to regain control of the site. But the official IRNA news agency said about 300 protesters entered the British ambassador's residence in another part of the city and replaced British flags with Iranian ones. The British Foreign Office harshly denounced the melee and said Iran has a "clear duty" under international law to protect diplomats and offices. "We are outraged by this," said the statement. "It is utterly unacceptable and we condemn it." It said a "significant number" of protesters entered the compound and caused vandalism, but gave no other details on damage or whether diplomatic staff was inside the embassy, although the storming occurred after business hours. In Washington, the White House issued a statement strongly condemning the attacks and saying Iran has an obligation to protect foreign embassies. The U.S. broke off diplomatic relations with Iran during the embassy siege in 1980. The semiofficial Mehr news agency said embassy staff had left the compound before the mobs entered, but it also said those who occupied the area had taken six staff as hostages. It did not give their nationalities and the report was later removed from the website without elaboration. The protesters broke through after clashing with anti-riot police and chanting for its takeover. "Death to England," some cried in the first significant assault of a foreign diplomatic area in Iran in years. More protesters poured into the compound as police tried to clear the site. Smoke rose from some areas of the embassy grounds and the British flag was replaced with a banner in the name of 7th century Shiite saint, Imam Hussein. Occupiers also tore down picture of Queen Elizabeth II. The occupier called for the closure of the embassy calling it a "spy den" - the same phrase used after militants stormed the U.S. embassy in Tehran after the 1979 Islamic Revolution and held 52 hostages for 444 days. In the early moments of the siege, protesters tossed out papers from the compound and hauled down the U.S. flag. Washington and Tehran have no diplomatic relations since then. The rally outside the British Embassy - on a main street in Tehran downtown - included protesters carrying photographs of nuclear scientist Majid Shahriari, who was killed last year in an attack that Iran blamed on Israeli and British spy services. State TV reported that another group of hard-line students gathered at the gate of British ambassador's residence in northern Tehran, at the same time. Britain's Foreign Office said it was in contact with embassy officials. Officials were still checking on the well-being of workers and diplomats, a spokeswoman said on condition of anonymity in line with standing policy. It also warned its citizens in Iran to "stay inside and keep a low profile." Tensions with Britain date back to the 19th century when the Persian monarchy gave huge industrial concessions to London, which later included significant control over Iran's oil industry. But they have become increasingly strained as the West accuses Iran of trying to develop nuclear weapons - a charge Tehran denies. In recent years, Iran was angered by Britain's decision in 2007 honor author Salman Rushdie with a knighthood. Rushdie went into hiding after Iran's Ayatollah Khomeini issued a 1989 fatwa, or religious edict, ordering Muslims to kill the author because his novel "The Satanic Verses" allegedly insulted Islam. The decision shortly after Iran detained 15 British sailors and marines in March 2007 for allegedly entering the country's territorial waters in the Gulf - a claim Britain denies. The 15 were released after nearly two weeks in captivity. In 2006, angry mobs burned the Danish flag and attacked Danish and other Western embassies in Tehran in protest to the reprinting of a cartoon deemed insulting of the Prophet Muhammad in the Nordic country's newspapers. Somebody wake up the guys from the SAS. There is some work for them. these are pics from the London looters, right ? Serkanner wrote: Somebody wake up the guys from the SAS. There is some work for them. Nuke 'em from orbit, it's the only way to be sure. Freakzilla wrote: Nuke 'em from orbit, it's the only way to be sure.